How many people attended the “DAY OF RAGE” March? Was it a success? What did they protestors achieve? The tabloids review the action. 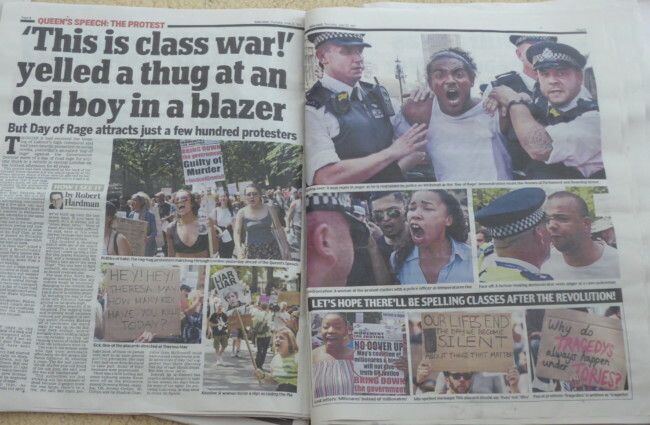 Daily Star: “DAY OF RAGE MARCH FURY.” The paper says protestors “clashed with police”. The Mirror made no mention of any aggro. The march “erupted in violence”. There were “several arrests”. How many were on the march to topple the Government? “Around 250,” says the paper. 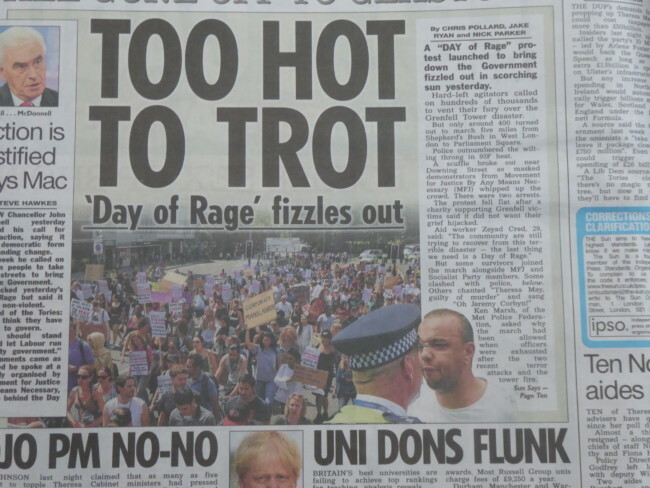 On Page 10, the Sun calls the marchers “the furious few”. 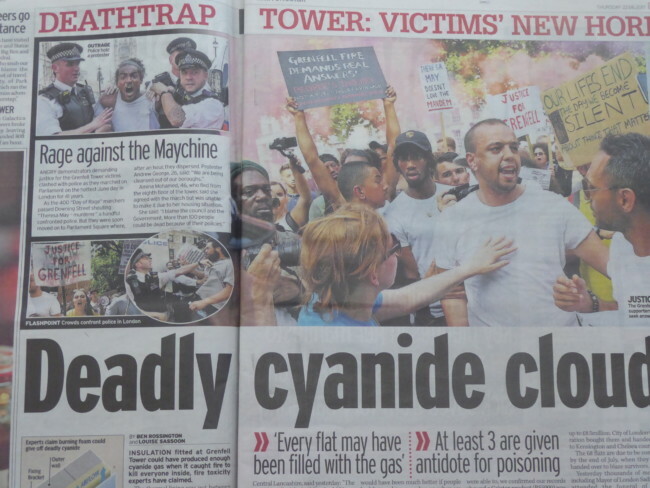 It was a day out for “freshly-minted Socialist Worker propaganda”. On Page 13, Rod Liddle tells readers the march was organised by “another tiny left-wing organisation, the Movement for Justice By Any Means Necessary”. They are “nasty, self-righteous, thick-as-mince Trots and snowflakes”. He says the people who suffered and the charities helping the Grenfell survivors “did not approve” the march. Their “misery has been hijacked by Left-wing nutters” – it was “egged-on by by the Labour Party”, specifically Shadow Chancellor John McDonnell. When McDonell doesn’t get his way “he can always be found standing in a street surrounded by furious anti-Semitic Muslim protestors, radical lesbians… bedwetting students and professional agitators”. “Hey! Hey! Theresa May! How many kids did you kill today?” ask the “few hundred” fair-minded marchers. One woman carries a poster of Jeremy Corbyn with the word “Hope” over his face. We learn that the march did include “some who had been personally affected by the fire”. One woman whose young son had lost a friend in the blaze in marching. We see a few banners. “WHY DO TRAGEDYS [sic] always happen UNDER TORIES?” asks one, the holder seemingly oblivious to goings on in Iraq and Libya.